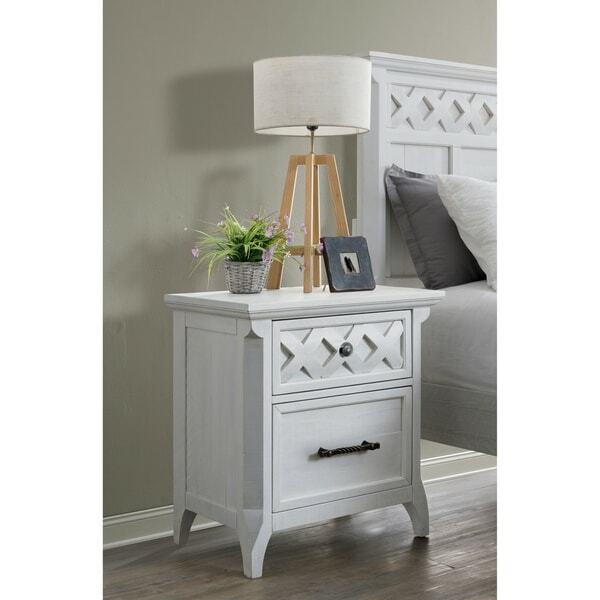 The Mendocino 2 Drawer Nightstand offers charming rustic styling with a coastal flair that features unique decorative elements inspired by lobster pots, rope twist and pier posts. Constructed of solid New Zealand pine for extra durability and strength. The nicely sized nightstand is perfect for bedside storage with the top drawer lined in felt to safeguard your finest belongings. The custom cast drawer pulls are reminiscent of hand-forged dock hardware. The English Dovetail constructed drawer interiors are built of sturdy plywood, sanded and sealed with lacquer and operate on ultra-smooth gliding, full extensions ball-bearing drawer guides. Dimensions: 28" W x 28" H x 17" D. Product Materials: Solid Pine, wood, metal. Item ships assembled. Made in Vietnam.